I’ve gotten pretty good at playing sheet music with open strings, so my instructor is now challenging me to work on 5th position. 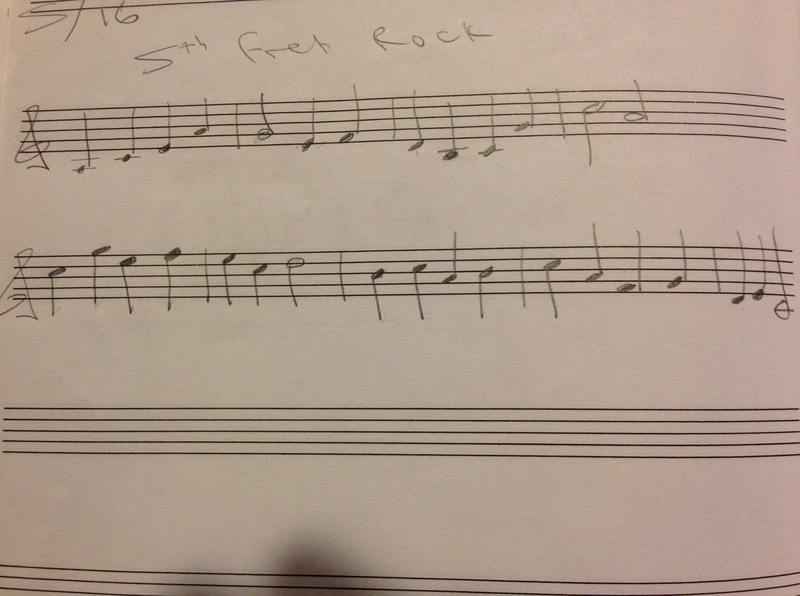 As part of my homework she wrote out this little diddy… “5th fret rock” (clever! :-)). In addition, I had to go back to p. 16 in my Modern Method for Guitar: Volume 1 book to play the second part to “Here We Go Again (duet)”… it runs about 40 bars, so it’s pretty rough getting all the way through, but I’ve been doing somewhat ok with it. Hopefully I can get it good enough in time for my next lesson. Lastly, for fun, I’m working on one of my favorite Clapton acoustic tunes, “Change the World”. I can get through all the chords, but then there is that solo that comes up. For a guy nicknamed slowhand, it sure does seem to move fast… I just keep hitting repeat, repeat, repeat, repeat, trying to drill it in my head; and hopefully through to my fingers! Previous 19 hours preparation for only a 48-minute performance? Yeah, it’s worth it!